New York-based tech training and education company General Assembly has been acquired by the Swiss human resources (HR) giant The Adecco Group in a deal worth $412.5 million. General Assembly provides courses in web development, coding, UI and UX design, project management, data science, digital marketing and much more. Originally it offered these to consumers but during the past few years it has transitioned to an enterprise-focused model, which likely spurred the interest from The Adecco Group. The acquisition means the HR giant, which is the largest provider of temporary jobs in the world, can provide training to its enterprise customers and the people who use its various brands for finding work. Furthermore, it gives it access to this growing market, where workers need tech and digital skills more than ever. However, increasingly General Assembly's revenue has been generated through B2B customers, which require employees to have skills relevant to today's digital workplaces. 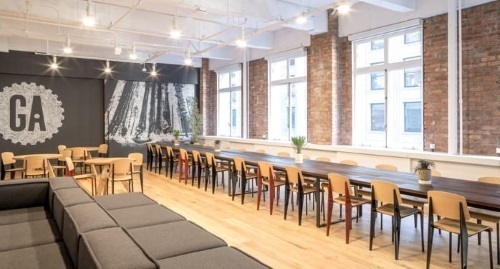 General Assembly was founded in New York City by Jake Schwartz, Adam Pritzker, Matthew Brimer and Brad Hargreaves in 2011 as a co-working space, evolving into a private school and then an education site. The company was valued at $440 million following a $70 million funding round in 2015, according to Axios, so $412.5 million could be regarded as a reasonable exit for the founders and investors, although they likely had hoped for more, especially with the growing number of companies wanting to train workers. Jake Schwartz, founder and CEO of General Assembly, said: "General Assembly has always been about creating bridges between education and employment -- that's what has allowed us to scale to 20 campuses, 50,000 alumni, and over 300 Fortune 500 clients. As our work with employers has grown, so has our need to connect in a deeper way with the world of human capital, and that is why we are so excited about the transformational opportunities that come with this partnership." He added: "We chose the Adecco Group because it brings a multitude of strategic opportunities to serve enterprise clients, solve pervasive digital skills gaps, and align our offerings with the world-class brands that comprise the Adecco Group network." Alain Dehaze, CEO of the Adecco Group, said: "The rise of automation also creates a critical need to re-skill workers, with as many as 375 million employees globally needing to transition to new roles by 2030. By offering General Assembly's services alongside the Group's existing talent development, career transition and professional staffing solutions we will be able to better respond to these client needs, enhancing both access to and the supply of the most in-demand skills." General Assembly will remain as a separate division inside The Adecco Group, with CEO Schwartz reporting to senior executive Sergio Picarelli.